Our sixth sense is an extrasensory perception beyond our five commonly recognized senses -hearing, taste, sight, smell and touch. 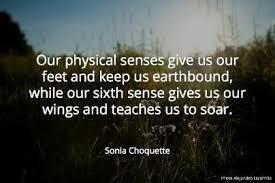 Our subtle perception (6th sense) is our ability to perceive a dimension that is unseen. Our capacity to recognize the mystic realms with our intuition, this is our extreme gift and how we are able to connect to our spiritual experiences. There will be times when a synchronistic event will be so overwhelming and overpowering, your physical vessel may react with an acute intense response. You may have feelings of anxiousness, dizziness or an emotional breakdown, in this case it would be impossible to deny the information that the Universe is granting you. Although the information that you intuitively receive may not what you want to believe or acknowledge, the synchronicity may be provoking you to make a massive change in your life, and as we all know change is not a welcome commodity for us humans, not always. Any event that is instigated by the universe that rocks your foundation, is not meant to frighten you, it is simply to give you answers to the questions that you have been asking in your mind.